We provide these services Monday through Friday, from 7am to 5pm, anywhere in Mission Viejo, Irvine, Rancho Santa Margarita, San Clemente, Laguna Niguel, and other cities in and near Orange County. Upon request, we can also accommodate same-day and weekend appointments. Our service trucks are kept fully stocked with commercial window washing soap, professional squeegees, screen mesh fabrics, screen frames, retractable doors, swinging screen doors, sliding screen doors, and commonly needed replacement parts, so that we have what we need to complete most jobs in one visit. If anything isn't readily available on our truck, we can special order it. All jobs are owner supervised, and we stand behind our work with confidence. T&S Window Screen Repair and Window Cleaning is proud to be a family owned and operated, local business. Our business was founded in 1990 by Tony and Saul, two brothers who learned the business from their uncle. Tony and Saul each bring more than 30 years of experience and an exceptional work ethic. Their success has been built on a commitment to value: At T&S Window Screen Repair and Window Cleaning, we always provide superior customer service, use high-quality products, deliver exceptional results, and charge affordable rates. Call today for an honest recommendation and an upfront quote. We serve residential and commercial customers throughout Irvine, Mission Viejo, Rancho Santa Margarita, Laguna Niguel, San Clemente, and beyond. Call today to learn more. T&S Window Screen Repair and Window Cleaning is a fully insured and licensed mobile screening contractor. T&S Window Screen Repair and Window Cleaning has provided superior window washing/cleaning services at very affordable rates to homeown T&S Window Screen Repair and Window Cleaningers, businesses, property managers, and realtors/real estate companies throughout Orange County, including Mission Viejo, Laguna Niguel, Irvine, San Clemente, and Rancho Santa Margarita for over 25 years. Window washing services involves thoroughly cleaning your interior and exterior windows, screens, and tracks using commercial-grade soap and squeegees. When we are done, your screens will be clean and dust free and windows will be streak free. Our window washing services automatically come with a five-day rain check, and we offer a 5% discount on service for new clients. 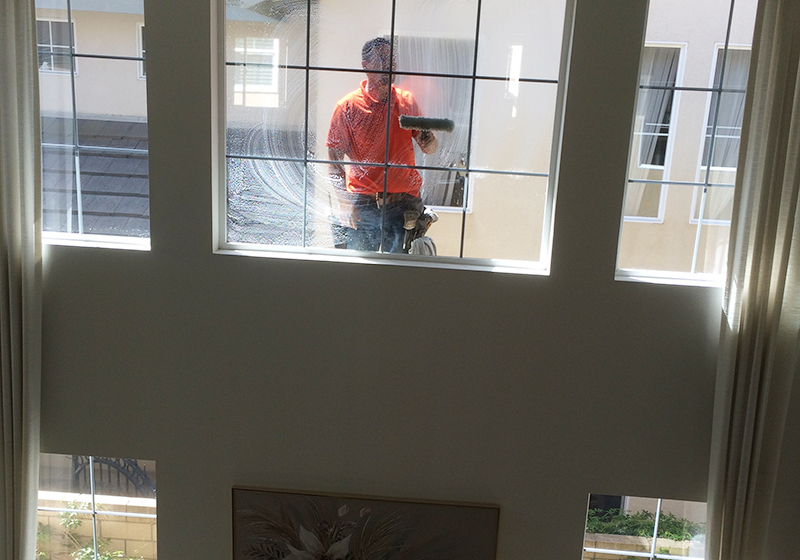 T&S Window Screen Repair and Window Cleaning is also your best choice for residential and commercial power washing services in Orange County. Power washing is an effective way to remove dirt, grime, oil stains, and water spots from home and office building walls, roofs, driveways, and more. We have decades of experience and know how to apply the right amount of water pressure to ensure that surfaces are safely and effectively cleaned. Call today for a free over-the-phone or on-site estimate. Our power washing services are available, from Fullerton, Huntington Beach, and Anaheim to Dana Point, San Clemente, and San Juan Capistrano. T&S Window Screen Repair and Window Cleaning provides expert solar panel cleaning. Our solar panel cleaning service is similar to our window cleaning service in that we use commercial soap, high-quality squeegees, and professing cleaning techniques. However, before we begin, we take the time to gently remove any debris with a special brush to avoid scratching the solar panel glass. 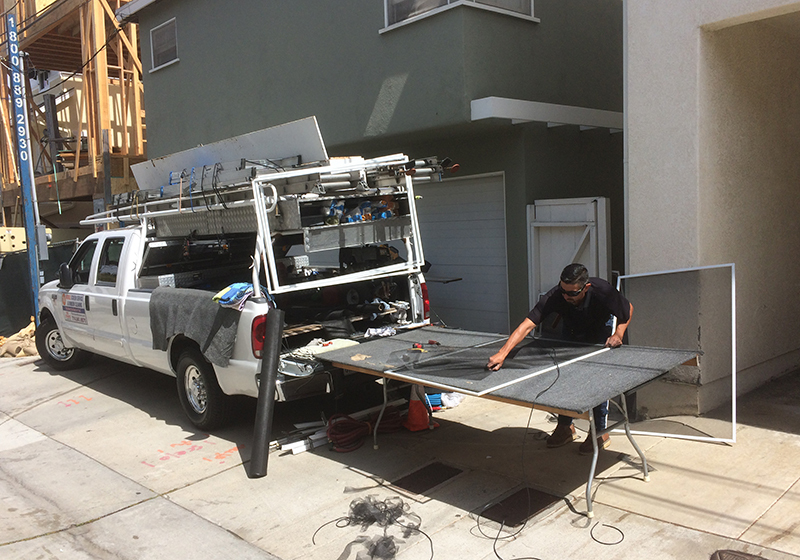 We can wash solar panels that are on the ground or on rooftops, anywhere in Irvine, Mission Viejo, Laguna Niguel, San Clemente, Rancho Santa Margarita, and surrounding Orange County cities. We rescreen windows, patio sliding doors, swinging doors, and retractable doors. If the screen frame itself is damaged, then we can repair or replace that as well. With our mobile screening service, we bring the shop to you. Because we have everything we need on our truck, we are able to complete rescreening and frame replacement in just one visit. We offer fiberglass, nylon, and solar screen mesh fabric, which are all effectively at keeping out bugs and mosquitos, and heavy-duty aluminum frames with metal corners in four different colors. We stand behind our mobile screening services with a one-year warranty on workmanship. 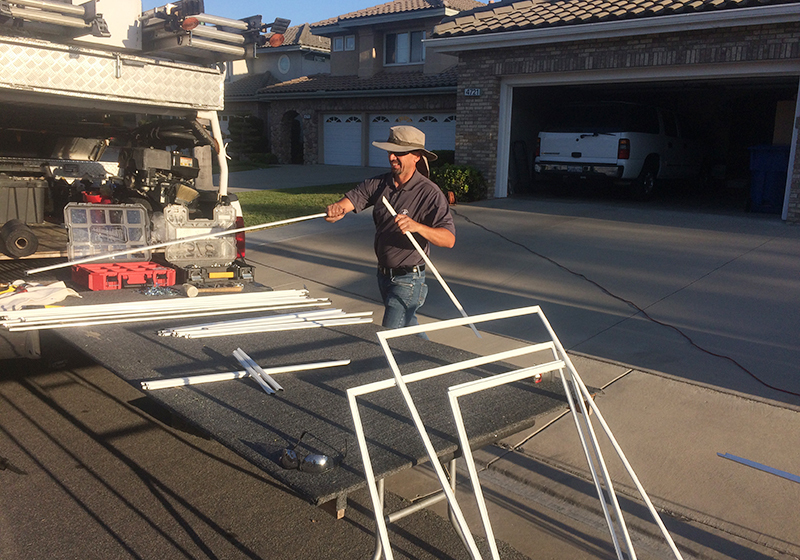 T&S Window Screen Repair and Window Cleaning offers sliding screen door installation, replacement, and repair in San Clemente, Laguna Niguel, Irvine, Mission Viejo, and other cities throughout Orange County. We measure and custom make our new and replacement sliding screen doors on site to ensure a perfect fit. You can choose from white or bronze aluminum screen doors, a 1¾" or 1½" latch, and standard, pet, or solar mesh screen. You also have the option of installing an aluminum pet guard in one of three sizes. Additionally, we offer sliding screen door rescreening services and repairs, which could include replacing damaged or ripped screens and replacing hardware. All of our sliding screen door services are performed by experienced technicians who use time-tested techniques and high-quality materials. They're also competitively priced and backed by a one-year workmanship warranty. Call today to set up an on-site quote. If you are interested in replacing an old or damaged swinging screen door or want to install an aluminum screen door for the first time, call T&S Window Screen Repair and Window Cleaning today. We're Orange County's experts in swinging screen door installation, replacement, and repair. We offer long-lasting aluminum swinging screen doors manufactured by Active in a variety of styles and colors. These doors feature fiberglass mesh fabric, a piston in the door closer to avoid slamming, and heavy-duty latches. They can also come with or without kick plates, grilles, or pet doors. Compared to similar doors available at big box stores, our aluminum screen doors are stronger, longer lasting, and better fitting, but our price are comparable. Additionally, our doors are custom installed by experienced professionals. Call today to learn more about our Active swinging screen doors. At T&S Window Screen Repair and Window Cleaning, we expertly install and repair retractable screen systems made by ClearView. Their high-quality retractable screens feature heavy-duty frames, a slow-close speed reducer (to avoid a slamming close), and durable screen mesh. These frames can be customized to fit single or double doors and open to the right or the left. They're available in a variety of colors and can be made with your choice of regular mesh screen, nylon pet screen, or solar screen. We also rescreen and repair most major brands of retractable screens, including those made by ClearView, Casper, and Wizard.We repair and replace top rails, bottom rails, handles, magnetic locks, and screens (either those that aren't retracting properly or those that have ripped or been damaged). We can usually accommodate same-day and next-day requests, and with our fully stocked trucks, we are able to bring our shop to you. Call today for a free quote. In addition to rescreening services, we also repair, replace, and install window screens. If the window screen's frame has been damaged, we can replace it with a white, bronze, almond, or anodized aluminum frame to match your other ones. These frames (including the corners) are made of long-lasting, premium-grade aluminum metal with high-quality solar, pet/nylon, or standard mesh and heavy-duty plastic pull tabs. They are custom sized and can be installed from the inside or outside depending upon your preference. While our professional window screen repair, replacement and installation services include quality material and expert workmanship, we always keep our prices very competitive. T&S Window Screen Repair and Window Cleaning can come out and clean your rain gutters as a standalone or add-on service when we are on site washing your windows or roof. Our team has been washing gutters for decades and can be trusted to get them fully cleared out from top to bottom. By removing all debris by hand and using a hose to flush them out, we're able to get your gutters, including downspouts, draining properly once again. Our screen repair experts arrive on-site with all the necessary tools to repair any door or window screen that has been ripped, warped, or damaged. We complete this window frame replacement and rescreening in Tustin, CA. T&S Window Screen Repair and Window Cleaning completed this second-story window cleaning for a home in Yorba Linda, CA. Windows that are higher up often have stains from bird poop or dead bugs that require the use of a special blade to scrape off. Our trained team excels at cleaning windows that are hard to reach and always uses commercial grade soaps and squeegees to achieve the best possible results.